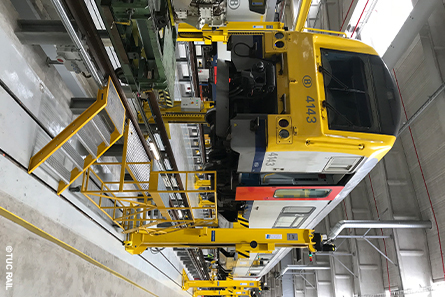 On 27 March 2019, the polyvalent workshop in Melle was officially opened in collaboration with SNCB. Design of this polyvalent workshop started in 2009 and work lasted from 2014 to 2018. The workshop is located on a 30 ha railway site along railway line 50 (Brussels – Aalst – Gent-Sint-Pieters) between Melle and Merelbeke stations. What makes this workshop “polyvalent” is that it maintains both traction and hauled stock. 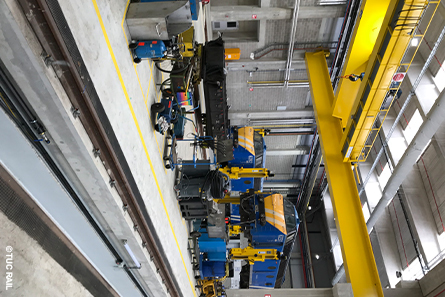 The project mainly consists of the construction of two maintenance halls equipped with tracks: a workshop for traction stock (for maintenance of electrical equipment) and a workshop for hauled stock (for maintenance of goods wagons). Both halls have a combined surface area of 40.000 m² and are equipped with the latest techniques. The halls have 17 km of tracks, 4 cleaning platforms and a supply facility. Movements of equipment are monitored by an industrial signal box. The industrial signalling is part of another TUC RAIL program, which also includes signalling of workshops in Kinkempois and Hasselt. The Melle polyvalent workshop is one of the largest workshops of the SNCB and operates with the most modern techniques.